Who are the entrepreneurs in your business? Sylvia Milosevic is a property entrepreneur and Wealth Alliance partner. 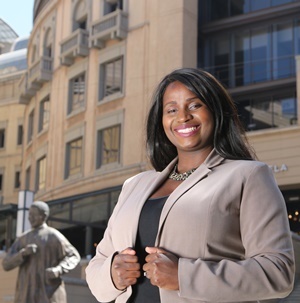 She shared more about her journey as entrepreneur with Fin24. I was born and raised in Ga-Rankuwa, Pretoria. Thanks to my mom, my love of property has been around since a young age and I always dreamed of one day having my own house. I was just a little shy girl with big dreams and I always felt that I was meant for something great in life. It all started with a difficult circumstance - when my dad, who was employed by BMW, lost his job. My family was forced to change its lifestyle. I realised then that relying on one source of income (such as a job and a salary) is not the solution. I started thinking about other opportunities and how best to reach my goal of attaining financial freedom. That is where my interest in property as an investment tool started. I knew that, if done right, property can provide the lifestyle I desired and put me firmly on the path to financial freedom. I am the co-founder of a company called Wealth Alliance. Our largest brand is Think and Grow Rich: A Lifetime of Riches in Property. My business partners and I, as well as our property mentors and coaches, focus on changing the lives of South Africans by giving them the right property knowledge and education. We took a brand, Think and Grow Rich by Napoleon Hill - which so far changed the lives of over 100 million people around the world using powerful principles that some of the wealthiest people in the world have in common - and we brought it to South Africa. We now apply these classic rules and discipline of Think and Grow Rich in the sometimes uncertain world of property investment. We have created the system by gathering powerful industry experts and creating the programme that is based on our many years of experience. We are solely focused on our students' success. We have managed to take average students with no prior knowledge and no money and turn them into successful property investors. We've taken working class employees who are always busy with their jobs and never had time to learn about property and have shown them that they don't need to spend much time with property by having the right mastermind alliance team of experts in their corner. And finally, we've showed people with property experience who felt stuck in their property journey how to reach that next level and scale up their business. What gap did you see in the market? Definitely a lack of education and clarity on how to go about investing in property. People usually know very little about how property investment works. The majority know only about bank financing. But what are we going to do if we don't qualify for the bond and have no money to invest? That's exactly what we are teaching our students, how to invest in property regardless of their credit score or the amount of money they might have. We cover several profitable strategies that the average person can use right now in the South African market to achieve great success through property investing. And the beauty of our programme is that we teach people how to use other ways of funding property deals, aside from bank financing. The main challenges were dealing with so much interest and gathering the right people to be part of our team. Mentors and coaches were specifically chosen with a proven track record and high level of expertise, with the goal of giving our students the best possible education. I believe we have succeeded in this as we now have over 10 000 people who have attended our events. What have been your successes? There is no greater success than when I have my students coming back to me to say thank you, because of you I have bought my first property. Because of you I changed my life for the better. Nothing can put more joy in my heart than seeing my students succeed because of this programme. These success stories are the testimony that this programme is bigger than me and that it is touching more lives than I ever imagined. Plans for the future are to expand to as many South African cities as possible and to change as many as lives as we can. After we helped South Africa, the plan is to go international very soon. Growth happens outside your comfort zone. There is always someone who is more successful than you and who is wealthier than you. If you are not there yet, my advice is to learn from as many people who are. We have them in our powerful network and they are willing to teach you how to reach that next level. Remember that nothing is impossible. If someone was able to do it, you can do it too. Napoleon Hill said: "Whatever the mind of man can conceive and believe, it can achieve.